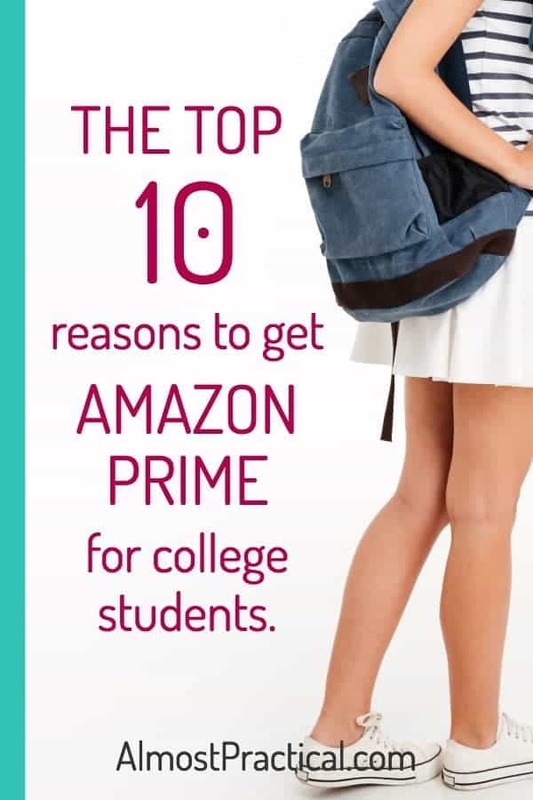 Here are the top 10 reasons to get Amazon Prime for college students. If your son or daughter is heading off to college this fall, make sure to get this. Chances are that you, yourself are an Amazon Prime member. If so, you are probably familiar with all of the benefits of Amazon Prime. I, personally, have been a member of Amazon Prime since they first introduced the program. As a result, my whole family has gotten really spoiled by used to all the benefits that Prime provides. Now that my son is leaving the nest and heading off to college – it's time for him to have his own Amazon account. And honestly, Amazon without Prime just isn't the same. They offer a 6 month FREE trial! If you sign up now – that will get your student through their entire first semester. After that they can decide whether they use the benefits enough to continue with their membership. The number two reason is the fast, free shipping. If your kids are heading far away to university – you aren't going to be able to drop that thing off that they really, really need – that they forgot at home. When one of my older sons went to his college orientation, he forgot his laptop charger at home. With Amazon Prime for college students, your child can take responsibility for ordering their own stuff and for managing the charges as well. Did you know that Amazon sells and rents textbooks, too? Sometimes school bookstores charge a premium for textbooks and you can find a much better deal on Amazon. With Amazon Prime for college students – your students can price shop for themselves. If they find a better deal, they can get the book quickly with the fast shipping that I mentioned above. As much as college should be all about learning, it seems that entertainment is also quite important. You could pay a competitor a monthly fee to get access to video streaming. Or you could sign up for a 6 Month free trial of Prime Student and get streaming included. Personally, I prefer Prime Video because if the video that I want to watch is not available to watch for free, there usually is a rental option for a small fee. As a member of Amazon Prime for college students, you also get access to college deals and exclusive promotions on things geared specifically to – you guessed it – the college student. Whether it's backpacks, dorm room essentials, or calculators and computers – you are sure to find a good deal on things you need to further your education. Prime Reading give you access to unlimited reading of a huge selection of books, magazines, and other publications. Think midnight research for a term paper that's due tomorrow. Unlimited photo storage is another benefit of Amazon Prime for college students. Let's face, your phone can fill up pretty fast, so it's nice to be able to offload your pictures and not worry about limits. Or, you could buy extra storage from somewhere else. Hmmm – free storage sounds better to me. So, I can't say much about this benefit because I am not a gamer – but just know that Twitch Prime is included in a Prime Student membership. Why not give Amazon Prime Student a try? I love Amazon's lightning deals. You can really catch some good sales. Student memberships also get access to this benefit although I don't think that my kids will shop the lightning deals the way I do. I see them using it more for specific things that they need as opposed to browsing around for a good bargain. Prime Music is another benefit of a traditional Amazon Prime membership. So, it is important to note that it is NOT included in the Prime Student free trial. But if you go on to purchase the membership after your trial period ends – then you will get access at that time. You can see the full list of Prime Student benefits here. Amazon Prime Student memberships are available to your student for four years from the time they sign up or until they graduate – whichever is earlier. You can see that Amazon Prime for college students is a pretty good deal – especially because they offer such a long free trial period. CLICK HERE to sign up for a 6 MONTH free trial of Prime Student today.